I’ve just started Year 2, studying bioethics. I’m due to graduate in 2016 with a Master of Science in Bioethics (policy specialization), from “The Bioethics Program of Union Graduate College and the Icahn School of Medicine at Mount Sinai”. (I was asked to use its proper name when referring to the program.) For anyone not from upstate New York, Union College is in Schenectady and the Ichan School (formerly called the Mount Sinai School of Medicine) is in New York City. This is a distance program, which I prefer to distinguish from an ‘online program’. Perhaps I’m a bit defensive? I often imagine I see an ever-so-slight wrinkle of the brow when I tell people. Sometimes it’s a distinct reaction to studying bioethics (ranging from “What is that…?” to “I don’t trust bioethicists…”) but more often there’s a hesitation about the nature of a degree earned primarily through web-based interaction. The experience is way more enriching than I expected, and of course there are lots of things I didn’t anticipate. I thought it might be fun to share answers to the most common questions I get when I tell people about what I’m up to. I was focused on bioethics already and just didn’t use this word for it. I called it “parental decision-making”, then “substitute decision-making” – which changed the tone from parental obligation to respect for autonomy. Making healthcare decisions on behalf of someone else is serious business, especially if it’s a life-long commitment and one fraught with relationship (parent-child) baggage. I wanted to get clearer on the issues and engage with a community of people already thinking about similar issues. Don’t they have a program in Toronto? They do! The Joint Centre for Bioethics (University of Toronto) is a well-respected professional degree program. Graduates earn an MHSc – a Master degree in health sciences. It’s a terminal program, which means there is no research project and students typically attend the program for professional development. If a graduate wanted to pursue a PhD in the field, she might need to backtrack and earn a different degree. I have friends who teach in the program and am honoured to occasionally speak to the students as a guest lecturer. I chose my current program because it doesn’t rule out a PhD program later. I also wanted to stay slightly removed from the clinical bioethics community here in Toronto, as I plan to continue my work as a healthcare critic and commentator. One of the consequences of not studying in Canada is that I’m learning about ethics and policy in an American context, with mostly American students. Not an insurmountable problem, but I’ll have to fill in the gaps myself when I’m done. 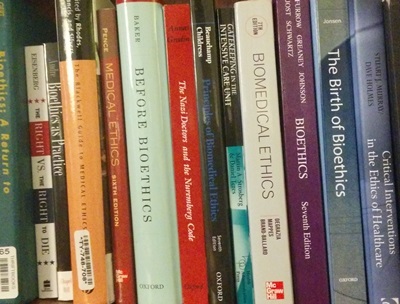 So, what is bioethics anyway? Bioethics is a new-ish field, emerging along a continuum that includes “medical ethics” – professional guidelines and codes of conduct for physicians and other healthcare practitioners. After several egregious human rights violations came to light through the 50s, 60s and 70s, the field was exposed to immense scrutiny from outside: media, academia and the public. In response, ethics in healthcare had to transform. Bioethics is now a multi-disciplinary field informed by philosophy, law, religion, various social sciences, economics and policy/government. There are distinct differences between academic (theoretical) bioethics and applied (clinical) bioethics. This course bridges the gap between the two, providing robust training in clinical ethics and academic teaching of philosophical foundations. What sorts of people are in your course? My classmates include physicians, healthcare clinicians, nurse practitioners, pastors, lawyers, administrators, professors and counsellors. There may be one or two others who came to the program as a lay person (like me). What courses do you take? I am in the Policy stream. The other 2 streams are Research Ethics and Clinical Bioethics. I chose the 3-year path, but there are 1- and 2-year options. Health and Human Values – a survey course for the whole program. I attend this course in person at the Schenectady campus. Full time for one week, summer 2013. Then, a two-term Master’s project. It can be an academic paper, a research project or some other project which fits the program’s parameters – perhaps a grant proposal, a training program, maybe even something unusual like a documentary or investigative journalism. The project is overseen by an appointed academic supervisor. The program is wrapped up with a Capstone week in Schenectady, where I participate in final seminars and present my project. Then, graduation. How does the whole online thing work? Each term has a definitive start and stop. No ‘go at your own pace’ (although you can skip terms if you need to). Each course is 10 weeks. Each student has access to an online education environment where our course materials are posted along with interactive forums. So far I think there’s been a range of 15 to 30 students per class. The professor posts the required reading each week, as well as any supplemental videos, PowerPoint presentations, audio lectures or whatever she or he has selected to support the week’s learning. Then the professor opens the week’s forum with a question or request for response. This is where the real exploration happens. Often it’s an open-ended question, but sometimes it’s a fragment of policy or current news. We are asked to comment intelligently, discuss our theories or viewpoints, refer to and cite the week’s readings, move the conversation forward. Some weeks I have commented only 5 or 6 times, but for others I have posted dozens of responses. The image included here shows a single thread. In this particular week we had to participate in 3 such forums, plus respond to classmates’ papers. It’s a lot of writing. Some classes have teaching assistants who monitor the dialogue and keep us on track. Up to 40% of our final grade is based on the quality of participation. This environment is great for people who communicate well in writing and who read quickly. Here is an example of a discussion question based on the week’s reading. This was from Bioethics and the Law, taught by Michelle N. Meyer, Ph.D., J.D. For the remainder of the grade, there can be an exam, a term paper and/or frequent written submissions. Some of our papers are shared with the class for comment. Any exams (although rare) are open book and conducted online. Some assignments are a bit unusual, but effective: for last year’s Policy class we were required to upload a PowerPoint presentation with voice-over commentary, essentially presenting a policy analysis to the class. Then each student was required to post an audio response to at least 2 presentations. Don’t you miss real classroom interaction? Not at all. I’ve met about half of my classmates and have a sense of each person – but even those I haven’t met, their personalities come through. Students’ politics, viewpoints and experiences are surprisingly salient, especially after attending several classes with them. Conversation in the forums is perhaps more measured and academic than real-life debate in the classroom. However, it’s also more thoughtful. We can post all week long and don’t have to cram all of our dialogue into a particular time slot. I do most of my postings late at night or early morning. I quite appreciate being able to go back through a thread and comment on older postings. Nothing gets missed. Having said that, attending class on campus for the required one-week intensive was critical to my feeling connected to the program. Most of the professors lectured during that week and I met many students in my cohort. I guess you’re going to work in a hospital when you’re done? Definitely not part of the plan! You’ll notice my headline at the top says “skeptical student of bioethics”. I’m cautious about bioethics as clinical practice (where a staff bioethicist is hired to consult to physicians about patient care decisions). Well-meaning and educated people all round, but I have a deep-seated suspicion that the role (generally) is yet another instrument of patient compliance and risk management. I want to continue the work I’m doing here on the blog and at Conversation Library but upgrade it from sideline to occupation. The work could take many forms but the underlying goal is to foster bioethics-related dialogue in the public realm. Open to any and all ideas! And, finally: no one has asked but I thought I’d include my current course description outline. Topic-wise, it’s my favourite so far. I know some of you would love the discussions. When is behavioral science sound enough to influence policy? I am so jealous- this looks like one million percent FUN!!!! Thank you for sharing. By the way, I did my post grad diploma in Theatre in Education at the Central School of Speech and Drama in London via distance learning. It was great. What an interesting field. That is truly an epic discussion thread!